Davinci has the right service for any purpose. Davinci Virtual Workspaces offer all you need for a successful business meeting in full-service professional business centers conveniently located around the globe. Simply reserve day offices, meeting rooms or board rooms as you need them, and never again settle for unprofessional settings in public meeting areas or pricey hotel meeting rooms. Davinci Meeting Room locations offer outstanding technology services. Davinci’s day offices and meeting spaces are designed for business. Davinci Conference Room rentals are fully equipped to make your meeting convenient and successful. You will have access to presentation tools such as smart boards, LCD projectors, plasma screens and many other tools and services. Many Davinci Meeting Room Locations are outfitted with the latest technologies for Audio/Video Conferencing including conference phones, HD video conferencing systems and collaboration tools. Davinci Video Conferencing is an online-based video chat product. Up to 25 people can be on the same call, and there is functionality to share screens and record the conference. The only things needed are a personal computer, hand held smart phone, or tablet device with camera – and an internet connection. There are no passcodes to memorize or logins to create. Simply share the link with your participants, and in one-click they are connected to the meeting. (Similar to WebEx and GoTo Meeting. Except more streamlined, easier to use, and the cost is significantly less.) Click here to learn more. Davinci Meeting Room Locations are staffed with a Lobby Greeter. Make the right first impression and have the lobby receptionist welcome your clients to the office and provide assistance. Any of our conference center locations provide a variety of professional business services to assist you in your business day. Services include copying and color printing, secretarial services, faxing, notary and transcription services, mailing, shipping, office supplies and much more. 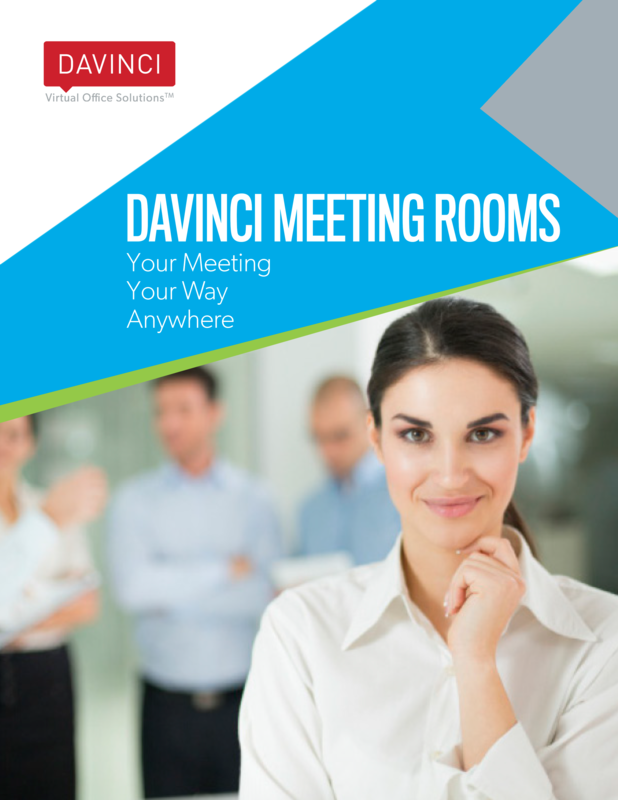 Contact Davinci Meeting Rooms to discover the managed office advantage! Davinci Meeting Room locations offer a variety of catering services. Have your next business meeting catered with food and beverage and ensure that your clients leave happy. Davinci offers some of the most competitive meeting room rates in the industry, starting as low as $5 an hour. As our name implies, Davinci Meeting Rooms is an innovator in specialized facility rentals. Davinci’s meeting room rental rates are far below that of the national average, letting you stretch your resources more effectively. Davinci Meeting Rooms’ workspaces, coworking spaces, and hot desks start at just $5 an hour, with day offices starting at $10 per hour. Our small conference rooms rental rates are among the best in the industry, beginning at a mere $10 for each hour. Medium conference rooms run for $20, and large conference rooms can dip as low as $30 an hour. Our training rooms come in at $25 an hour—making it easy to get your crew together without breaking the bank. Davinci’s facilities provide you with a host of amenities and conveniences to support your event. You can count on a lobby greeter to welcome your guests, and an administrative assistant should you need one. Each room has presentation tools such as LCD monitors and projectors, audio and video teleconferencing equipment, smart boards, and lightning-fast Wi-Fi. There is an on-site business center that can handle fax, mail, copy, printing, and notary public needs. We even offer food and beverage catering to keep your attendees fueled up during your meeting. Why spend more money for fewer services? Book your room with Davinci today and give your business event the professional touch it demands, at a price that you deserve. Despite the disruption of technology and exponential growth in virtual conferencing solutions, face-to-face meetings remain a very important part of today’s business world.They are simply more effective. This Solutions Guide outlines the reasons why the use of rented meeting rooms is on the rise, when you should use one, and how to go about selecting and using them. It also provides an overview of Davinci Meeting Rooms, which offer entrepreneurs and companies of all shapes and sizes over 5000 meeting rooms in 1500-plus locations and more than 50 countries.